The splendid setting of Sydney Harbour becomes the stage for one of the most fabulous and largest annual fireworks displays in the world, watched by millions of people around the globe. The 9pm display offers an opportunity for families with young children to enjoy the celebrations. 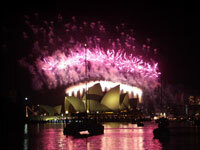 The midnight spectacular covers a four-mile (7km) stretch of the harbour and the fireworks fire from barges on either side of the Harbour Bridge and from the bridge itself. Other activities take place throughout the evening. These include the traditional Tall Ships Parade decorated with lighting effects and various carnival attractions. There are often musical concerts and shows included in the evening's entertainment, as well as sound effects to accompany the fireworks display.